So, the deal is that Chrome uses a “multiprocess” architecture, if you will. You can just think of this like a multi-core processor in your puter. That’s one big reason why Chrome is so zippy. With multiprocess, there are 2 “cores” (and probably more, eventually) so that one engine does the UI stuff, and the other engine draws web pages. The result, according to Mozilla, is a 400% increase in responsiveness and a 700% increase in speed when pages are loading. Well, shiver me timbers, it’s about bleepin’ time!!! 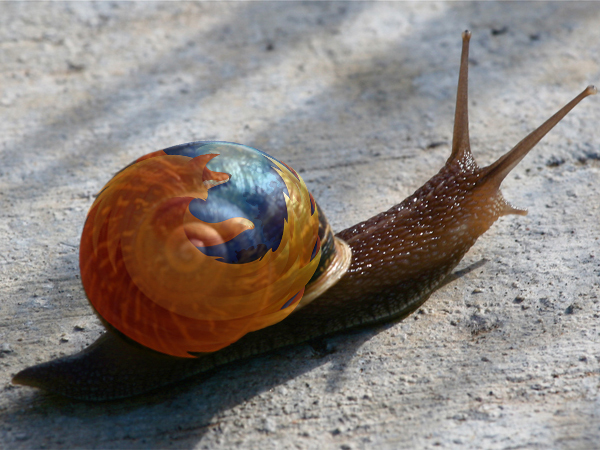 Just how good is multiprocess Firefox? Well, I enabled it. Then I loaded some web pages, especially those that have been really slow lately. Firefox feels like Chrome now! It’s a HUGE difference. Naturally, there is a catch: Not all Firefox add-ons are fully compatible yet with multiprocess mode, so you may have to deactivate some of your add-ons for the time being until they are all updated. Not to worry: it’s pretty easy to sort it all out. How do I use multiprocess mode in Firefox? You may already be using it, but it’s unlikely if you have some add-ons installed. So, the first thing you need to do is install the Add-on Compatibility Reporter, which is a special add-on made by Mozilla that does exactly what its name suggests! Note that the first add-on is the Compatibility Reporter. Also, in the upper right-hand corner, you can see that it tells you if multiprocess is enabled – or not. It also shows you which of your add-ons are compatible right now with multiprocess mode, and which aren’t. And that’s the little catch: You must click Disable for any add-ons that are marked as incompatible. 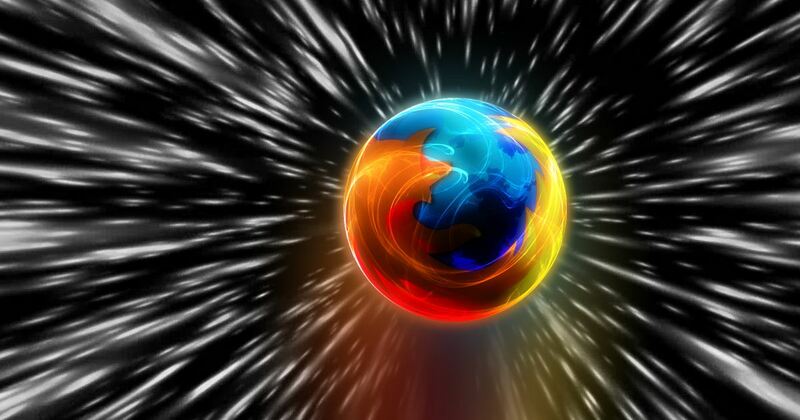 Then restart Firefox. Most likely, this means you will be living without some of your beloved add-ons until they are updated. But frankly, the performance boost is totally worth it. NOTE: Even though an add-on may be marked as “Compatible with multiprocess”, it may not actually be compatible yet. 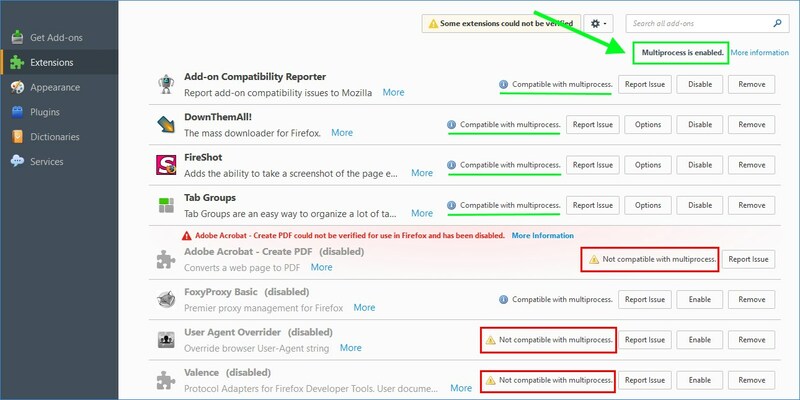 If you disable the add-ons marked as incompatible, and it still doesn’t show that multiprocess is enabled, disable your remaining “compatible” add-ons one by one (restarting Firefox each time) until it shows that multiprocess is working. One such add-on that is marked as compatible but that currently is NOT compatible is Tab Mix Plus. Furthermore, in January Mozilla will release a new version of Firefox that automagically enables multiprocess mode for more users – but an incompatible add-on will still prevent it from working even then. You can also update your add-ons every now and then, and the Add-on Compatibility Reporter will update the multiprocess compatibility status. 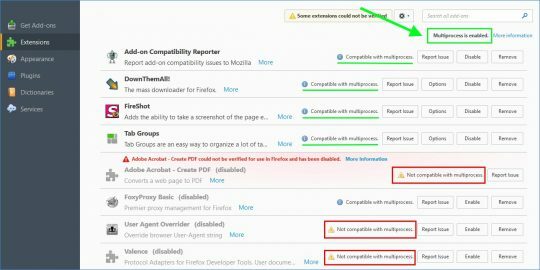 If an add-on becomes compatible, re-enable it, and restart Firefox. The culprit is very often an add-on that hasn’t been updated as quickly as Firefox itself is updated. This breaks things, and causes lots of interesting problems. Just because your add-on has worked fine for the last 5 years doesn’t mean it will work fine tomorrow when version 5,231 of Firefox is released. Everything is constantly changing! So yeah, add-ons are part of what makes Firefox great, but they’re also a part of what makes it not-so-great… sometimes. The easiest way to check this is to close Firefox. Then, hold down the Shift key on your keyboard, and click your Firefox icon to restart it. Choose “safe mode” in the popup window. This will start Firefox in Safe Mode – with all add-ons disabled. If everything is great again, you know one of your add-ons is the issue. You then need to restart Firefox normally, and then disable add-ons, one by one, until the problem disappears. BOOYAH! You now know which add-on is causing the problem. If there is no update available for the add-on, you can either wait until it’s updated, or find a different add-on. In any case, do try multiprocess mode. It’s really great!